I couldn't decide between pegboard or french cleats, so I thought I'd go with both! I'm finally getting settled into my new shop space. Old habits die hard though, and I'm really trying to maximize the use of the space, even though I have more room than I did previously. 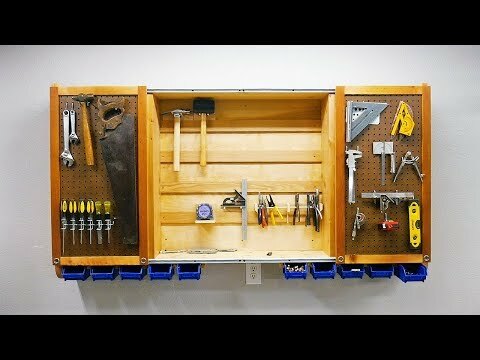 With that in mind, I wanted a tool cabinet for the most-used tools so they could be easily accessible. I also wanted some hidden storage for some of my consumables like glues, finishes, gloves, etc. To help me achieve what I was looking to do, I found a cool set of tandem door hinges from Rockler which allows you to have two doors at different depths in the same cabinet. Really nifty! I also liked the sliding door feature I built into my old shop cabinet so I reintroduced that here for the very often used items so they would be quickly accessible.